There's a moment near the end of law school when your law school drops a bomb on you. Not a literal bomb. But when you see the envelope the bomb arrives in, you'll wish there was dynamite involved. I'm talking about when you receive the final tally of all debt accumulated during the preceding three years of law school. Inside my envelope was a letter that said I had accumulated $129,000 in debt in the preceding three years. But that wasn't all. I had been on a tear, running up debt for the prior five years. Between two trips to graduate school (both my wife and myself), a rental property, a condo, a wedding, a honeymoon, and a new car loan, we had run up $755,000 worth of debt. We were educated, but making dumb financial decisions. The irony is my wife is actually very frugal on a day-to-day basis — and she's taught me to be frugal as well. We rarely eat out, buy groceries on sale, pack our lunches, and rarely get expensive lattes. But it was the big items that were sinking us. So, we decided we had to get our debt under control. Our first step was to catalog what damage had been done. We started by adding up all of our debt, lines of credit, and mortgages. I felt like an insurance adjuster walking amongst the wreckage of a home that had been leveled by a natural disaster. Except this disaster was of our own making. The total dollar figure was shocking, but not unexpected. And adding it all up helped us to move to the next step. Our second step was to evaluate what debt we should pay down first. Around this time, I began reading as much personal finance advice as I could get my hands on. I began by reading Get Rich Slowly, I Will Teach You To Be Rich and other financial advice blogs, and soaked up advice from Dave Ramsey, Clark Howard and other financial gurus. Unfortunately, we weren't able to pay down much of the debt right away, because the job market as I graduated from law school in 2007 was bleak. I worked for a few years for small law firms, which paid equally small salaries. Here was the worst part: I hated it. I had always harbored a burning desire to work for myself, and working in a stifling and stuffy law firm environment was like throwing kerosene on that yearning. I was torn between a paycheck and a passion. Rental property We had a small rental property in Sacramento, about two hours' drive from our house. Rents had gone down so we were absorbing a $300-400 loss each month. Plus, my wife hated being a landlord. It was a bad combination. Condo Our highest debt by far, we knew we knew we would need a larger home sooner or later. New car loan We were paying 4.5 percent interest on a Toyota Prius, which was our highest interest rate. The car actually saved my wife hundreds per month in gas. But we knew paying off this loan was most manageable. Graduate school debt My law school and my wife's graduate school debt added up to about $150,000, but the interest rates were low. We knew this was our lowest priority debt. The problem for us was that most traditional financial advice wasn't helpful. The most common advice aimed at people who are in debt is to “pay off credit card debt first.” That didn't really help us because we didn't have any credit card debt. We did have an equity line, which for a few years was treated by many (including us) like a credit card. The second most common advice we heard is to pay off the high-interest debt first. Thanks to historically low interest rates at the time, almost all of our interest rates were very low. As a result, we weren't sure where to start. Then we got news that lit a fire under both of us. In early 2010, we found out that we were going to be parents for the first time. We were filled with excitement and plans for the future, but we were nervous about having a new mouth to feed. Next, our tenants told us they would be moving out of our rental property. The real estate market was horrible at the time and the neighborhood surrounding our rental had more than its share of foreclosures and short sales. If we sold the property, we might have trouble getting a price that could pay off the existing mortgages. Yet we knew if we found new tenants, it could be another couple years of losses before we would have the opportunity to try to sell again without tenants living in it. We decided to bite the bullet and sell. First, we had to spend $3,000-$4,000 to fix up the property and prepare it for sale. Many newly pregnant women dream of spending days and nights decorating the new baby's nursery. Instead, my wife and I spent days and nights at Home Depot and fixing up our vacant rental. We did most of the work ourselves to save money. My wife was a good sport, probably because being pregnant got her out of most of the heavy labor. Then we caught a lucky break: buyers were actually attracted to our property because it was one of the few non-short sales in the neighborhood, meaning they knew they could close without needing to wait for bank approval. As a result, the property sold rather quickly. We had enough from the sale proceeds to pay off the mortgages and pocket a small amount. The investment in fixing the house up had paid off. Three months later our son was born. Mom was happy he wasn't born a landlord. About a year later, our son was just about to turn 1 year old and I was itching to quit my job and go to work for myself. We still had plenty of debt, but had managed to whittle it down to around $560,000 by selling the rental, which freed up funds to pay down more debt. Again, the financial advice seemed to fail us. Conventional wisdom would have been to refinance our condo mortgage, but our interest rates were already historically low. Plus, it was the square footage and communal living that bothered us the most. I considered getting a job on the side, but knew that wasn't a realistic possibility, especially with a young son at home I wanted to see. Around this time, we visited a financial adviser to get some advice. How we got this financial adviser is a funny story. My wife went on biddingforgood.com and found a financial adviser who was auctioning off a series of meetings with him for his son's preschool. We had no affiliation with the preschool but we bid on and won the package anyway. (Bidding for Good is a great way to buy services at a discount and to support good causes.) Valued at $1,000, we got three meetings for a flat $100. I thought it was the ultimate cheapskate's achievement to get $1,000 worth of financial advice for one-tenth of the cost. The adviser said I shouldn't start my own firm until we had $100,000 in savings. It was probably good advice — but I knew it would take me years to save that amount, and I couldn't wait that long. I tracked the revenue I brought in. I closely watched what clients and revenue I brought in to the firm, because I knew I could at least count on that revenue if the clients came with me. I researched low-cost overhead options. I spent time researching low-cost or no-cost software, hardware, and technology for my new business. I learned to fend for myself. I made sure I knew how to do everything myself so I didn't need to pay for a high-priced assistant. After about six months of doing this research, I knew I was bringing in enough money to quit my job. I quit in September 2011 — right around my son's first birthday. Fortunately I was busy right from the get-go, and most of the clients I worked with at my prior firm decided to come over with me. As a result, we were able to pay off the car loan. After I got established with my new business and was starting to accumulate some savings, our next big hurdle was to sell our condo. After nine years in the cramped two-bedroom, one-bath condo, we were ready for a change. The only problem was the condo association had recently been through a recall election, which killed a lot of interest in the unit. Interviewing real estate agents. We interviewed numerous real estate agents to find an agent who was a good fit for us and familiar with the neighborhood. Researching comps. We poured over recent sales to find comparable properties' final sale price to estimate how much we could expect to receive in proceeds from the sale. Interviewing painters, stagers & other professionals. We interviewed many professionals whose services we expected we would need. Putting excess furniture and clothing in storage. Over nine years we had accumulated a lot of stuff. We sold off or stored a lot of these items. Finding a rental. The condo was too small to live in while we were selling it, especially with our toddler son. So we found a reasonably priced rental. After we moved out, the workers moved in. All told, we spent more than $10,000 on paint, repairs and improvements. That was a bitter pill to swallow, but we knew if we hadn't spent the money we could have waited six months or longer to sell it. Interest was slow at first, but after about three or four months, we found an all-cash buyer. Our agent definitely earned her commission, as the homeowners association's liabilities were a barrier too high for many potential buyers. It felt strange going from being a landlord for many years to being a tenant again, but the satisfaction of paying off all that debt was definitely worthwhile. After we closed escrow on the condo, we had eliminated about 80 percent of the debt from our high of $755,000. We still have law school and graduate school debt, which fortunately is the lowest interest rate of all our debt. So we're not there, yet. But it feels like we've made great progress, and that's half the battle. Best of all, our son loves having more space to run around in, and enjoys playing on a new play structure in our new backyard. And you can't put a price on that. There are 57 reader responses to "Reader Stories: How I paid off $610,000 in debt, became a dad and quit my job — in 2 years". Most of your debt was eliminated by selling two properties that you had equity in. I was expecting to read some interesting tips about paying down debt, but this was just shifting your equities/liabilities line around a bit. Don’t get me wrong, it was an interesting article and I enjoyed reading how you got the properties ready for sale, but I found the subject line misleading. I’m not sure what you mean by deferred mortgage debt, and yes, we are renting now. I am still a fan of homeownership and plan to buy property again, although I hope the next time to put a larger chunk down so the amount financed is not as great. Ah, did I confuse people there? Maybe a bad choice of words on my part. What I mean is that you repaid your mortgages, but you don’t have a paid off home so the mortgage debt is “deferred” in way because you’re waiting until it’s the right time to buy and take on debt again. 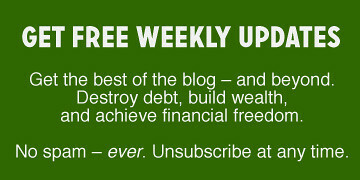 To explain, I don’t think of myself as “debt-free” because there will (hopefully!) be a mortgage in my future. Renting makes sense for me right now, my mortgage is on hold. I actually liked the perspective. So many “paying off debt” articles are things like “well, I just made more money, tightened my belt, and went at it.” I appreciated hearing that being landlords wasn’t the smartest move, so they sold. And they didn’t just sell each time — they put money into fixing up the properties to really get top dollar. I feel like so many PF articles are about generating passive income or making more money, and it was nice to hear from one that was about getting rid of assets. Presumably, the author might have more breathing room for savings and thus be able to make a better downpayment when they do buy again down the road — after they’ve paid off their school debt. Hi Leah — thanks for your comment. I’m glad you liked the perspective. I tried to convey that making more money is not always an option, and simple fixes like paying down credit cards often oversimplify a situation. In our case, it was a very difficult decision to sell both of our properties but I think it was the right decision at the time for us. I felt a little bit the same way. Plus, there wasn’t much about being a dad and related expenses. I’m not criticizing the article, which I enjoyed, it’s more the title: most of the debt had equity, not much dad info, and he didn’t really “quit my job” he started his own business (which would have been handy in the title). I could do a “How I went from $80,000 in debt to $0 in 3 months” article. The total article would be that “I sold my home” (the end). I’d likely even pocket some money on the deal. FYI, that would be a really bad move for me financially, my mortgage is lower than many apartments that would be smaller (and probably worse shape and worse neighborhood). Hi Gary: I’m not suggesting that everyone go out and sell their homes to eliminate their debt. But in our case, the rental was dragging us down and we had outgrown the condo, so we had to sell both of them, even though I would have liked to hold on to them long-term. So we made the best decision we could for our financial situation at the time. Hi Tracey: That’s right, most of my debt was paid down when I sold off the two properties. However, as I think anyone who has owned property over the last four years can attest, just because your debt is secured by real estate doesn’t mean it is always an asset that is easy to liquidate. What I tried to convey in this story (perhaps not well enough) was that it’s not always simple to get out of debt, especially when you have properties of questionable value. Thanks for your comment! I have to admit that big number certainly got my attention! More so, it’s an impressive feat to recognize “hey, we made these mistakes” and “this isn’t working for us — let’s change it.” The more of these types of stories I read, the more I realize the number doesn’t mean as much as people admitting they made mistakes and taking responsibility for their actions. What I don’t understand is how it was possible to take on that much debt in the first place? Don’t get me wrong: that question isn’t a criticism towards John. I’m just wondering how the U.S. financial system made it possible to have two mortgages, a large line of credit and a car loan before he had even finished his education? I was just thinking the same thing. Then again, it sounds like these purchases took place before the bubble burst. I don’t think this could happen in 2013. I graduated from law school in 2007, so most of these loans were obtained prior to that. However, I have to say I think this could happen again. Both of the home loans were primary residence loans when I obtained them, which are generally easier than rental property loans. And it’s not hard to get loans for grad school or for a new car purchase. I wanted to hear more about how you racked up that debt too, so thanks for the additional info. Hi Elizabeth – thanks for your comment. Glad you liked the piece. I hope others will agree with you and focus on taking responsibility and taking action toward righting the ship if they find their ship sinking. I agree with the first reader who said all he did was shift around his debt by selling his condo. I too was expecting to see some tips on paying off “regular” debts such as student loans and what not. I found this article interesting. I relate to the wife’s feeling of not wanting to be a landlord. A lot of people get into rental properties without knowing the day to day time consuming drudgery of all that’s involved. We live in an expensive part of the country. So all of our debt is in the mortgage with a tiny student loan and a 0% car loan and a small 401k loan. There is not a lot of advice out there for financial moves when you have low interest debt. I think our priority would be accelerated payments for 401k loan and possibly for the mortgage as well. Frankly I’m glad it turned out to be something ordinary (paying off debt with equity). If it had been an article about someone with the income to pay off “regular” debt in that time frame I’d have been ticked off that the site owners were so out of touch. I became a little disenchanted with one other blog when I realized that the owner saves more money in a month than I can save in a year. I’m an aggressive saver, so it basically comes down to he has more income than he knows what to do with. While “money sense” matters at all income levels, certainly the questions are a bit easier when you essentially want for nothing. Looking again, I see many people are talking about the title being misleading. “Why I decided to sell my two homes to get out of $600,000 in debt” would have still had a draw and been more accurate (again, still just selling their equity but more accurate) and people actually looking for information that was relevant to them would not click on the article (if they don’t have homes to sell). Hi Gary — Good suggestion. That could have been a good title for the piece as well. Thanks. My takeaway is that the debt numbers are huge, but John’s INTENT to simplify and change his situation (triggered by a newborn son and need to run his own business) is key. Relative to his income, it is a high-risk situation, and it’s amazing how the American lifestyle and market has allowed this level of debt to be common in many cities, as John’s story will testify. It takes work to sell a home! So having to do it twice with child is no easy task. Hey, it’s a huge start! Just wait til you lighten the student load debt. You will have unbelievable piece of mind…. Here’s to continued progress. Most docs and lawyers have too much ego to downgrade the lifestyle. This must have been humbling enough. A lesson learned that materialism isn’t what it’s cracked up to be under the wrong circumstances. Income is relative. As someone who has nowhere near $600,000 in assets or debt, it wasn’t really helpful for me. I also assume his income was well into the six digits, something I will never experience as a public schoolteacher. When I see the word “debt” I think of unsecured debt…the kind that can’t be paid off by selling it. If you owe less than it’s worth (as long as there is a market to sell it), it’s not significant debt in my mind. I owe as much on my house as it’s worth. I have decades till I can pay it off, but it’s not negatively affecting my net worth, and I’m not too concerned about it right now. Plus, I’d have to pay for housing one way or the other; at least the money I pay is going toward ownership. Student loans are my only other debt. I can’t sell anything to pay off my debt. I own three cars, but two are ancient and not worth much except to my college-aged kids who are driving them. I have a great amount of respect for schoolteachers, and I highly agree they are underpaid. In fact, my wife works at a public community college as a faculty member so technically, she is a public schoolteacher, though at a community college and not a high school or an elementary school. We make a good living but not really well into the six figures. And when we sold the two properties, they were both right about even with the mortgages at the time we sold. In the case of the rental, the property ended up selling over what we owed on it, though with commissions we didn’t really walk away with anything. The condo actually sold for a good chunk less than we owed on it, meaning we had to pay into escrow. I’m still glad we did it. I’m glad you can stay in your home. In our case, we really couldn’t stay in the condo as we’d really outgrown it. If we hadn’t outgrown it, I probably would have said we shoudl stay. John, you said you were two hours from Sacramento. If you’re living in SF or close by, you must have missed a tremendous rise in price on your condo this past year, perhaps 20% or more. It would be hard to buy back in now considering the number of all-cash foreign buyers bidding on properties. What are your thoughts on that? John, I admire your guts to do what was necessary to rebuild your financial life. While it makes me queasy to think of carrying that much debt in my own life, I know that my perspective is much different than yours because my income level is less. I have friends (and used to be this way myself) who think that more income brings with it the responsibility (to our friends and family, mostly) to “fit the lifestyle” that comes with earning higher wages. I have a feeling that it still wasn’t the easiest decision to restructure your lives by selling property and changing careers. My story over the last few years is similar to yours, but on a much smaller scale. It’s still a counter-cultural decision! Hi FI Journey – thanks for your comment, and I’m glad you liked the article. You’re right that it wasn’t an easy decision deciding to sell the two properties. And it makes me queasy just thinking back to having as much debt as I did. I’m really glad to have most of it behind me (though not all). Good luck to you – I’d love to read your “Reader Story”! Rebalancing is an important tactic to employ with a portfolio of investments. Most folks know this already. But the significant impact that can occur when the liability side of the equation is rebalanced can often be overlooked. John did well. He evaluated his priorities and restructured accordingly. He can breathe easy, knowing that his future income is his to do with as he pleases. Hi Jan: Thanks for your comment. I didn’t get too much into discussing liability, but you make a good point. With our rental property, we were at risk because a blown water heater or sewer line could happen anytime, which would be a significant expense. If that rental had more equity, it would have been a better risk. But because it didn’t have much equity, and because the rate of increase in value was slow, the benefit did not outweigh the risk. I think it’s great anytime someone can paydown debt and live the life they want to live that’s the real message out of this. Fix up your house, sell a rental, get a side job, get out of something you don’t like and do something you really enjoy, congrats to you. There is not just one way to get out of debt, other than hard work. Thanks for the article. Hey John! As a current law student about to graduate, I appreciate how ‘calm’ your article read. I was wondering though, what did you do with the student loan debt after graduating? Did you make minimum payments while focusing on other debt? Did any of the graduate school debt disappear at all? And if possible, could you share how you plan to pay off that large amount of graduate school debt? Thanks! Hi Abhay – it seems like there’s a lot of interest in that debt, so I’ll have to do another post on that topic. The short story is yes I’ve paid down some of that debt, but it’s a low interest rate so our initial focus was on the other types of debt. You basically paid off your $8000 car loan in two years. This isn’t incredibly helpful to most people who are looking for financial advice. I paid off $10,000 in student loans, $5000 in credit card debt, and $6000 in car loans in three years. It did not involve real estate shifting. It involved a lot of budgeting and overtime. I’m not trying to be harsh, but it doesn’t seem like your dramatic headline fit your actual situation. Hi Amber: You sound like you have an interesting story to tell – I’d love to hear more about how you paid off your student loan, credit card and car debt. As for my car loan, that’s right that it did take two years to pay off the car loan, but the larger point I was trying to make in the article was that sometimes a debt repayment strategy can be complicated when there isn’t one highest-rate debt to tackle first, or when the dollar amount of the debt is so high it seems unachievable (even if some of the debt is secured debt). I hope those reading the article are inspired to try to pay down their debts anyways, in spite of the challenge. Yeah? Well I just paid off 4 MILLION DOLLARS of debt by giving my wife back the money she never lent me. Decent enough article but it’s very hard to build trust with the reader when the headline is misleading for sensationalism. BIGSeth: I’m sorry you didn’t like the headline. It seems the general objection to the headline is that the $610,000 included a mix of secured and unsecured debt. I do not feel like I hid the fact that some of the debt was secured. I think many people who have sold real estate in the last four years will say that just because a debt is secured doesn’t mean it’s easy to sell. I did not intend to pass off a judgment on others’ achievements in paying down unsecured debt; I only intended to share my story and hope others found value or inspiration in it, in spite of the fact that some of my debt was secured. 4 Million Dollars! Surely you jest. Hey, I remember you from your Sac days! Glad you’re doing well. I came over to the comments of this article to write the same thing that many others had already written. The title of a blog article is so important, you want to bring as many readers as possible to read the article, without ticking them off. In this situation, it seems many of us feel pretty misled. Having a child had nothing to do with anything. And its not like you actually paid off tons of debt and then were able to quit your job, either. You simple sold a house. Just doesn’t seem genuine, after reading the article. If I buy a ridiculous car with a $50k loan, and then decide to sell the car, and clean it up, and advertise it, and sell it at basically break even… did I pay off $50k? I still don’t have a car and now I’m renting one! I simply sold an asset that didn’t suit me anymore. Hi Samantha: I’m sorry you didn’t like the headline. As I mentioned in reply to another reader’s comment, it seems the objection is that some of the debt was secured and some was unsecured. In both cases, it was debt, so I simply added up the amount of my debt at the high point and we used that as the headline. I hope you found some value in my sharing my own personal story, in spite of your objection to the headline. I tried to convey in the article (perhaps not successfully) that it wasn’t as simple as just selling a house – in the past four years, selling real estate has not been a simple process. I don’t feel I hid the fact that some of my debt was secured and other debt was unsecured. I enjoyed the read, it is great to hear about different perspectives, different paths and, hopefully, ultimate success. As a landlord myself, I can say it is not easy being a landlord and it is not easy to sell rental properties in a chaotic market, so to me this was a success story, in that you sold at a profit. And, you also simplified your balance sheet. Renting can be a very smart choice for people, especially when one is in flux, new family, new career, etc. Add in starting your own business and, to me, it was an impressive story. Thanks, Sam. Good for you for taking on the challenge of being a landlord. Owning investment property is definitely a good way to build wealth, as long as you pick a good property in an area where there’s going to be good appreciation. Wow! this story was really inspiring,Im thinking about quit my job as well, and focus on start my own business, even though I dont owe anythign besides my school loan, Im kind of hesitating about it, thank so much for sharing and inspiring, I hope everything keep going great for you! Thanks, Lali! Good luck with your new business. That’s a brave decision, but working for yourself can be very rewarding. I was very pleased to see an example of a serious real estate seller. I have purchased several properties over the last decade and looked at literally hundreds more for potential purchase. I am incredibly tired of sellers that don’t seem to have any interest in actually selling their homes. Real Estate agents have a saying that, “Buyers are liars.” In my area they usually require a pre-qualify or pre-approval letter before they will engage with a prospective buyer. That is fine, I am sure they get too many looky-loos that waste their time. But, I have had several selling agents who will still not show properties they have listed on the MLS. Nor would they make an appointment to show at a later date. This is after proof of funds and a strong record of purchases have been demonstrated. And many of the sellers don’t really put their homes in a condition ready to sell. They often make viewing extremely difficult. Often there is considerable deferred maintenance. Twice I have had sellers back out for little reason. In one instance an older couple just changed their mind and didn’t want to sell even with a full-price standard contingency offer. In another deal, the seller didn’t like the fact that there would be follow-up specialist inspections on the old plumbing and AC and decided to back out of an already signed contract. To see a seller committed enough to do major fix-ups, repairs, repainting and (HURRAY!!) move-out so that it can be shown is excellent! I wish there were more serious sellers on the market. I would also love to see you write an article on how to be a serious seller. Thanks, Frank. I think an article on how to be a serious real estate seller could be interesting. I’m not sure if it’s a perfect fit for GRS, but I may take a crack at it and see if I can make it interesting to the GRS audience. Thanks for the suggestion! Your story was interesting enough that I interrupted my wife to tell her the highlights. I like hearing about new situations, what the challenges were, and what it took to get out of them. I’m also glad that so many people have taken issue with the headline. Since this is not your first writing gig, you knew that it was disingenuous. I hate misleading headlines more than I like good articles, and you’ve indicated that you had input on the title, so I will not be reading your work again. Dear John: Your post clearly illustrates the art of headline writing. I thought it was a good post and you analyzed the pieces of your debt well. (highest to lowest priority). Paying off the car loan is an important smaller success that research shows we need to keep to a longer term debt reduction plan. (recent Dan Ariely post). If you write a second post, I think expanding the dad part, adding more of your wife’s perspective, the value of a second income and benefits, plus how you juggled child care (and costs) would boost interest. Wishing you continued success! Thanks for these great suggestions, Dana! I’ve gotten feedback from a number of people that they’d be interested in hearing more about how to juggle child care costs, so that seems like a good topic to tackle soon. I really am not sure why people are going on about the headline. This article highlights many very useful points. This writer had the sense to let go of properties that were placing a burden on him financially. He is renting now…as I am and I am a physician and until you do so after releasing yourself from a mortgage, you really may not understand the sense of freedom not having a mortgage brings. He was not trying to mislead anyone. He had a huge amount of debt and he gave up the false idea of owning a mortgaged home to reduce the emotional pressure debt brings. He is now free to earn less, live in a smaller home if he wants to. He has made some sound financial choices and worked closely with his wife in doing so and should be very strongly commended for doing so. A lot of you who have an issue with his heading will likely remain in the financial states you are in because you are unable to learn from what he has done. Thanks, Gem. I definitely had a sense of relief when we paid off the mortgage, especially considering had the market gone down further, it probably would have been a big stretch to pay off the mortgages. I’m not opposed to taking on mortgage debt again, but next time I’ll probably be more cautious about not stretching myself too much financially. Nice try, Gem, but my financial state is excellent, thanks. Our house has been paid off for 20 years. The title was misleading because he paid off his debt with money he already had! Big deal. I was looking for how he earned the money to pay it off so quickly. Thank you for your story! It helps to read about others who are in similar situations! Great read. It is important to implement a strategic financial plan when trying to get out of debt. Readjust your priorities and allocate your money spent accordingly. Make responsible, effective, and efficient purchases. Spend and save money wisely. Disappointing. They have good jobs and a lot of material goods to sell and payoff things. How about someone making 10/hr and having 200k in debt? ?